Close your eyes and remember the amazing beauty of sand and sea with this wonderful handmade Seashell Table Runner. Think of the frothy aftermath of gentle waves and the warm soft sand between your toes. Coastal or Beach Style decorating used to be limited to beach houses and powder rooms. Now, more and more the coastal vision is making its way into every room of the home no matter the location. So, wherever you live on the beach or are land locked, the coastal get-away look captivates in uncomplicated style for the breezy relaxed feel of a seaside vacation all year long. The key to Coastal Style is to use a coastal theme simply, in neutral and understated ways, and with some unexpected surprises that make it refreshing and unique. 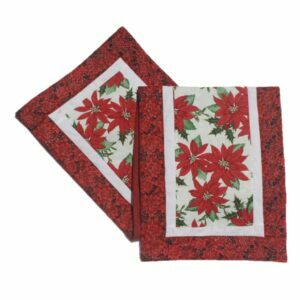 This handmade table runner with compliment and coastal style you use. California Coastal – accents the relaxed sophistication of Old World European furnishings and the occasional touch of Asian style accents. Atlantic Seaboard Coastal – accents the relaxed cottage feel of nautical themes, light houses, boating and other sea faring influences. Gulf Coast style – works well with wicker, rattan and West Indies influence. Let the tranquil beauty and atmosphere of land and sea and the sun-bleached color combinations highlight your coastal decor. Go make your home beautiful. P.S. 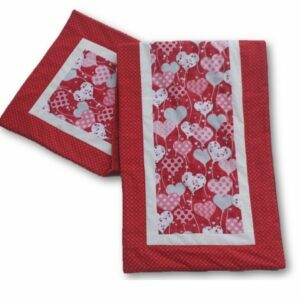 Take a look at the coordinating place mat set. Machine-wash in cold water, gentle cycle. ( which I plan to make into valances ) are lovely, vibrant and very well made!